Adopting an ERP system can bring many benefits to a company. But to reap the benefits you need the team to adopt and embrace the new technology. 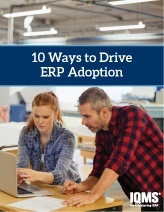 What is the best strategy to increase ERP adoption? People and teams excel when they can see their progress towards goals daily. Increasing how teams are using an ERP system can increase the ownership everyone has for accomplishing team and company goals. And best of all, each person can see how they are making an impact on the company by having access to an ERP system.